One of the greatest challenges faced by entrepreneurs and inventors who have a great idea for a novel medical device is funding. While a government-funded grant is often a good option, this can be a daunting and unpredictable journey, fraught with frustration and disappointment, as highlighted in our blog in December last year. And, if the amount required by the entrepreneur to build and test her prototype is quite modest — say $100,000 — then the venture capital industry will likely have little interest. So, what other sources of finance might she consider? Crowdfunding is one viable option that has emerged in the past few years. One of the best-known crowdfunding platforms is Kickstarter that, since its launch in 2009, has enabled almost 5 million people to pledge over $757 million, thus supporting more than 47,000 creative projects. Entrepreneurs set a funding goal and a deadline and then if people visiting the website like the project they can pledge money, often receiving something in return. Funding is all-or-nothing, meaning that projects must reach their funding goal to receive funding, and to date 44% have reached their goal. The most successful project to date was the Pebble smartwatch where the goal was $100,000 and over $10 million was raised in just 37 days! 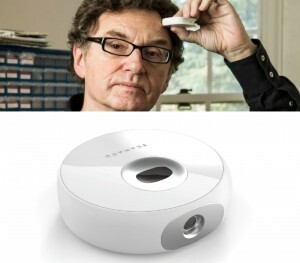 Walter de Brouwer, CEO of Scanadu, holds the Scout between his thumb and index finger. Another crowdfunding website is Indiegogo which earlier this year enabled a start-up medical device manufacturer called Scanadu to raise $1.7 million — its target was just $100,000 — in less than two months. Scanadu’s novel device is called the Scout, inspired by the Tricorder system from Star Trek, which is used with a smartphone and enables a person to measure his or her own vital physiological parameters: heart rate; body temperature; blood pressure; respiratory rate; and blood oxygen saturation. For a pledge of just $199, funders will receive their own Scout plus the app in March 2014. For some time now Israel has been a hotbed for the development of medical devices with nearly 700 companies operating in this market. One of the country’s most successful entrepreneurs is Daniel Yachia, a urology professor who co-founded InStent in 1996 and subsequently sold it to Medtronic for $200 million, who has just established a new crowdfunding platform called B-a-MedFounder that focuses exclusively on medical devices. As Yachia says, “There are people in many different countries who have bright ideas, but don’t have the contacts to show them.” Now, with crowdfunding, that obstacle may no longer exist. Perhaps of interest to this group and thread, I just read about a related new crowdfunding campaign launched by Eclipse Breast Health Technologies. They are looking to test and eventually bring to market a wireless sensor meant to aid in the early detection of breast cancer and the tracking of patients being treated for the disease.